Today’s walk into Falmouth is much more gentle than those that preceded it yet the Helford River is a very special place its beautiful winding wooded creeks gradually receding as the Cornwall Coast path follows the cliffs to the pretty whitewashed National Trust village at Durgan which sits in its own steep sided cove. Two outstanding gardens are passed here, the coast path running below Trebah and Glendurgan Gardens both of them open to the public and set in tumbling, ravine-like valleys that run down to shingly beaches where they meet the coast path. Glendurgan in particular is a stunning sub tropical garden with great blooms and foliage from around the world, whatever the season and as it’s a shorter days walking today a visit to one or other garden is easily possible and fits in well for those staying at Mawnan Smith. Back on the path leaving Trebah beach which was an embarkation point for the D-Day landings in June 1944 each new viewpoint gives better and better views ahead across the Fal. Mawan Church is worth a quick look, just off the path, overlooking the entrance to the Helford River and there are plenty of Cormorants, shelduck, egrets and kingfishers to keep an eye out for along with Morgawr the giant sea serpent sighted fairly regularly since 1926 in the Fal area ! Further on is the prominent headland of Rosemullion and suddenly a splendid open area of grassy downland with great panoramas. Refreshments are possible at the pub and cafes on Maenporth Beach marked by its notable wreck of the Ben Asdale Trawler which was driven onto the rocks on New Years Eve 1978. Pause at Swanpool so named for the swan breeding that went on here and now a local nature reserve before entering Falmouth by the appealing Gyllyngvase Beach. 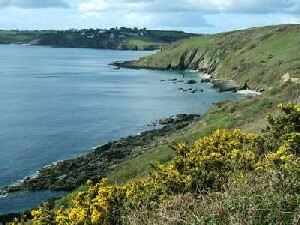 From here a pleasant amble along the seafront takes you round the bay to visit dramatic Pendennis Point. 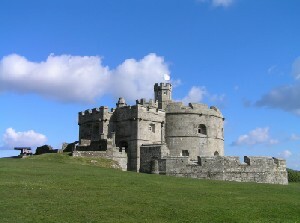 Pendennis Castle or “headland of a fort” was built by Henry 8th to protect Falmouth from the French and is a superbly located site right on the coast path and well worth a visit. Its steeped in history and also able to provide the inevitable end of walk cream tea. This is as good a location as any to finish your long trek as you guard the entrance to the mighty Fal River here whilst gazing back towards the mighty Lizard recalling the wild wanderings that brought you here.